DALI Fazon 3 5.1 review | What Hi-Fi? Previous Fazon systems had a tendency to knock on the door of greatness without quite being able to step through it. Previous Fazon systems had a tendency to knock on the door of greatness without quite being able to step through it. That changed, however, when this package graced our testing rooms last year, and ultimately it picked up the Award for Best Style Speaker Package £1200-£2000. We still love the Dali. 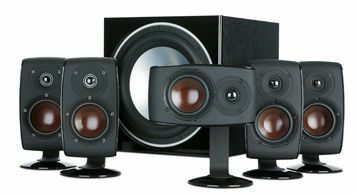 Its smart-looking speakers sum up for us what style systems are all about and, although they might be a royal pain to assemble, this needs to be done only once. After that, their mountings let you move them between walls, dedicated stands and aftermarket supports with ease. Even before running in, we knew we’d be on to a good thing; it’s a fluid, articulate and easygoing sound. And after a solid weekend of limbering up, these characteristics are even more apparent. Subtlety is no problem for this system; fine detail in voices and ambient sound-effects is treated with fine facility, and dialogue is never flat. There’s impressive scale for satellite speakers of this size, too, even in a relatively large room. You don’t get the out-and-out punch of the Monitor Audio system on p70, but then again, you don’t have to accommodate that setup’s bigger cabinets, either. The Dark Knight’s Batpod chase scene is a favourite tester for us at What Hi-Fi? Sound and Vision, and the Fazons handle the complex effects steering without breaking a sweat. They send bullets whizzing around the surround-sound field without drawing too much attention to themselves, and they time well when it comes to percussive shotgun blasts. The package’s musical sensitivity is the best on test here – no small achievement given the difference in price between it and the Monitor Audio package. There’s a lovely open quality to the performance, with instruments placed precisely in the surround (or stereo, if you choose) field, and none of the at-times brittle treble served up by the Bowers & Wilkins speakers. However, as we noted in our First Test back in November, the E-12F subwoofer isn’t quite as precise as we might hope, especially given the abilities of the rest of the speakers. There’s a bloated quality that, while consistent with the system’s overall tonal character, sits at odds with its speed and accuracy. Given Super 8’s trouser-flapping train-crash sequence to deal with, it lacks the last word in punch required to deliver those tight, concussive effects. The same is true with music; the quick-fire bass-drum kicks in Black or White from This Is It aren’t given the surgical precision they benefit from with the B&W PV1. That changed, however, when this Dali Fazon 3 5.1 package graced our testing rooms last year, and ultimately it picked up the Award for Best Style Speaker Package £1200-£2000. We still love the Dali. Its smart-looking speakers sum up for us what style systems are all about and, although they might be a royal pain to assemble, this needs to be done only once. After that, their mountings let you move them between walls, dedicated stands and aftermarket supports with ease. Even before running in, we knew we’d be on to a good thing; it’s a fluid, articulate and easygoing sound. And after a solid weekend of limbering up, these characteristics are even more apparent. Subtlety is no problem for this system; fine detail in voices and ambient sound-effects is treated with fine facility, and dialogue is never flat. There’s impressive scale for satellite speakers of this size, too, even in a relatively large room. You don’t get the out-and-out punch of some closely prived rivals, but then again, you don’t have to accommodate their bigger cabinets, either. The Dark Knight’s Batpod chase scene is a favourite tester for us at What Hi-Fi? Sound and Vision, and the Fazons handle the complex effects steering without breaking a sweat. They send bullets whizzing around the surround-sound field without drawing too much attention to themselves, and they time well when it comes to percussive shotgun blasts. The package’s musical sensitivity is most impressive – no small achievement given the difference in price between it and the Monitor Audio Apex 5.1 package. There’s a lovely open quality to the performance, with instruments placed precisely in the surround (or stereo, if you choose) field. However, as we noted in our First Test back in November 2011, the E-12F subwoofer isn’t quite as precise as we might hope, especially given the abilities of the rest of the speakers. There’s a bloated quality that, while consistent with the system’s overall tonal character, sits at odds with its speed and accuracy. Given Super 8’s trouser-flapping train-crash sequence to deal with, it lacks the last word in punch required to deliver those tight, concussive effects. The same is true with music; the quick-fire bass-drum kicks in Black or White from This Is It aren’t given the surgical precision they benefit from with the B&W PV1. That’s a small criticism, though. The Dalis are still Award-winners, after all, and this likeable, easy-listening package should definitely be on your must-audition list. It deserves every one of its five stars here.